Looking for a mask that works? As in hydrates and plumps out lines like no other? 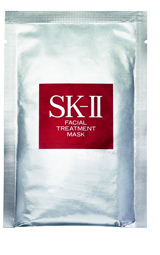 Then you want to know about this mask called Facial Treatment Mask* from luxury brand SK-II. Instantly replenishes skin's moisture - Rich in amino acids and minerals, Facial Treatment Essence increases skin moisturization immediately. Helps smooth your skin's surface texture - Facial Treatment Essence helps make skin texture even and helps smoothes the skin's surface. Helps moderate the skin's surface renewal cycle. - Facial Treatment Essence enhances skin's natural exfoliation rate to improve skin's appearance. Helps make skin tone brighter. - Facial Treatment Essence helps make skin more translucent giving you a youthful and luminous glow. I say that Pitera is a miracle ingredient, because the way it smoothed out my skin and kept it looking visibly more fresh and young for days, says it all. This is a mask that is made of cotton soaked with the product. It opened easily and contoured to my face well. I left it on my skin for about 15 minutes before removing and rinsed it off. I cannot express how happy I was with the results. The lines around my eyes and mouth were notably diminished. I believe that my skin was so plumped of moisture that they were gone for almost a few days, when I witnessed them coming back. These masks do not come cheap, as a box of 6 sells for $85 and a box of 10 is $120, but I figure that $12 a mask (when purchasing the box of 10) is well worth it, when used when needed. If I could afford it, I would use a mask every few days, but for now, I will use them preceding a special event, and I might even work them into my weekly routine. SK-II products are sold online at sk-ii.com and are also available at Saks Fifth Avenue. *Press sample submitted by brand for consideration.